March 17 commemorates St. Patrick’s Day here and worldwide. Born in Roman Britain, Patrick was kidnapped at the age of 16 by Irish raiders and taken as a slave to Gaelic Ireland. While away, Patrick found God, and when he was able to return to the land of his birth, he became a priest. Patrick later returned to Ireland with a goal of turning the pagan Irish into Christians. Through his evangelical efforts, he converted thousands to Christianity. Patrick died on March 17, 461. In Ireland, St. Patrick’s day celebrates Patrick and the arrival of Christianity into Ireland, as well as the culture and heritage of the Irish. Americans also celebrate their Irish heritage (and that of their friends!) with St. Patrick’s celebrations. These celebrations traditionally include Irish fare, shamrocks, green beer and wearing green so you don’t get pinched. Like many celebrations, parties will be held in St. Patrick’s honor. If you’re attending one and want to bring something that showcases your Irish spirit, we have selected a few tasty recipes. Visit Leaning Ladder for products that will give your St. Patrick’s Day fare a special twist. Add ground meat to a large skillet with diced onions. Cook until meat is browned and onions are cooked. Add remaining ingredients and stir well. Allow to simmer until most of the liquid has evaporated, about 15 minutes. In a large mixing bowl add hot potatoes, garlic, sour cream, salt, pepper and olive oil. Mash with fork or potato masher until a creamy consistency is reached. 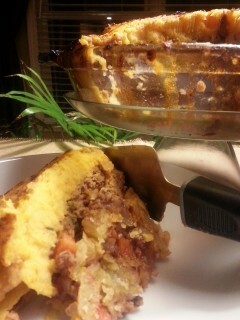 Place meat mixture into a deep dish pie plate. Top with potato mixture. Bake at 350 degrees for about 30 minutes or until potatoes start to brown on the tips. Sprinkle with cheese or fresh Parsley if desired. 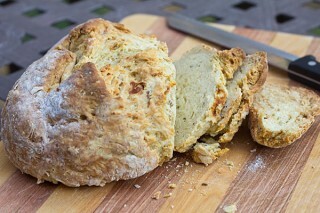 This is a super easy bread that can easily be customized by adding herbs, cheese, sundried tomatoes, raisins etc. Below is the basic recipe, and we substituted extra virgin olive oil for butter or margarine. We enjoy dipping this bread into our rosemary infused olive oil sprinkled with black pepper. In a large bowl, mix together flour, sugar, baking soda, baking powder, salt and olive oil. Stir in 1 cup of buttermilk and egg. Turn dough out onto a lightly floured surface and knead slightly. Form dough into a round and place on prepared baking sheet. In a small bowl, combine butter olive oil with 1/4 cup buttermilk; brush loaf with this mixture. Use a sharp knife to cut an ‘X’ into the top of the loaf.